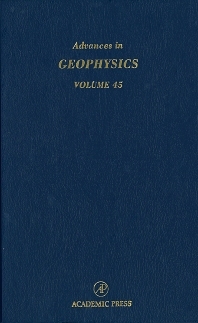 Shape and Microdynamics of Ice Particles and Their Effects in Cirrus Clouds Author: Pao Wang, University of Wisconsin, Madison, U.S.A.
Max Wyss, Geophysical Institute, University of Alaska Fairbanks, U.S.A.
Advances in Geophysics Volume 45 presents two main topics of noted interest to the geophysical community. The first topic is ice particles in the atmosphere. Mathematical descriptions of ice particle shapes, their growth rates, and their influence on cloud development are presented. The second topic is earthquakes and seismological mapping. The authors present their research involving predicting the location and intensity of earthquakes. Libraries as well as academics and professionals in all areas of geosciences, including geophysics, geologists, hydrologists, climate modelers, oceanographers, and petroleum explorationists.